The process or technique of recording motions during sleep. 1. The supposed mental ability to control the movement of objects from a distance as with "psychokinesis": Sam told his children that he had the power of telekinesis and could remove a stone from one side of the river and place it on the other side, but after a while, he said it was just a joke! Telekinesis is the ability to influence the behavior of material objects with mental control alone. Psychokinesis, "mind-movement", or PK, is the more commonly used term today for what in the past was known as telekinesis or "distant-movement". 2. 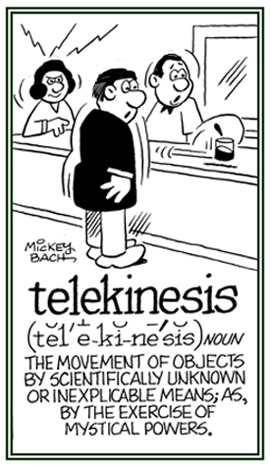 Etymology: from Greek tele-, "at a distance" + Greek kinesis, "motion, movement" from kinein, "to move". © ALL rights are reserved. Since 2004, the term "remote influencing" is used by some people to express certain kinds of psychokinesis. 1. Movement, or inhibition of movement, in response to contact stimuli. 2. A change in the velocity of linear or angular movement of an organism in response to a contact stimulus. A reference to thigmokinesis or a change in the velocity of linear or angular movement of an organism in response to a touch stimulus. Showing page 13 out of 14 pages of 200 main-word entries or main-word-entry groups.